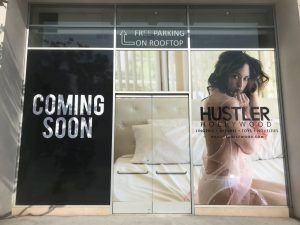 Hustler Hollywood has two locations in Los Angeles, one in West Hollywood and one in Hollywood. We did a few interior signs for the Hollywood location a couple years back, you can read about the digital prints here and the illuminated box sign here. The West Hollywood location on Sunset Blvd. is the first location, and they are actually moving this year. The store isn’t moving far, just up the block and across the street, but they wanted to make sure that customers had advanced notice of the new location so they reached out to us to get some temporary window graphics. To get started on the window graphics, we went out to the location to do a site survey and get the necessary window measurements. Hustler Hollywood always provides us with the necessary art files for what they want on their signs, so the design process is not too difficult. We simply laid out the graphics based on our window measurements to determine how much material we’ll need and how the graphics should be positioned. After we receive approval on the proof and rendering we provide to the customer, we can start on production. As the graphics were meant to be temporary, we used removable vinyl. The graphics were digitally printed onto the removable vinyl and laminated for UV protection. Our laminator can laminate up to 52″ wide prints which is wider than the width of the largest windows, so those graphics had to be made in two pieces. A lot of time was put into the installation to make sure that the two sides of the images matched up, and that the seam was as less noticeable as possible. Are you interested in getting full window graphics for your business? If you are interested in a more permanent option, we also offer full window graphics printed on perforated window vinyl so the windows aren’t completely blocked out.